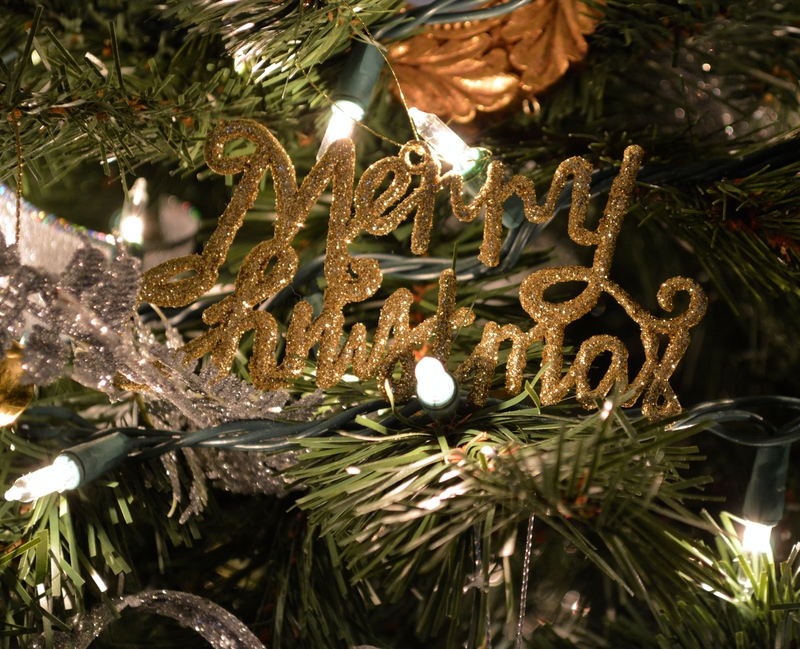 I did a post when I first started the blog with some tips + tricks I use for our Christmas tree but I realized it is probably a good time to update things! 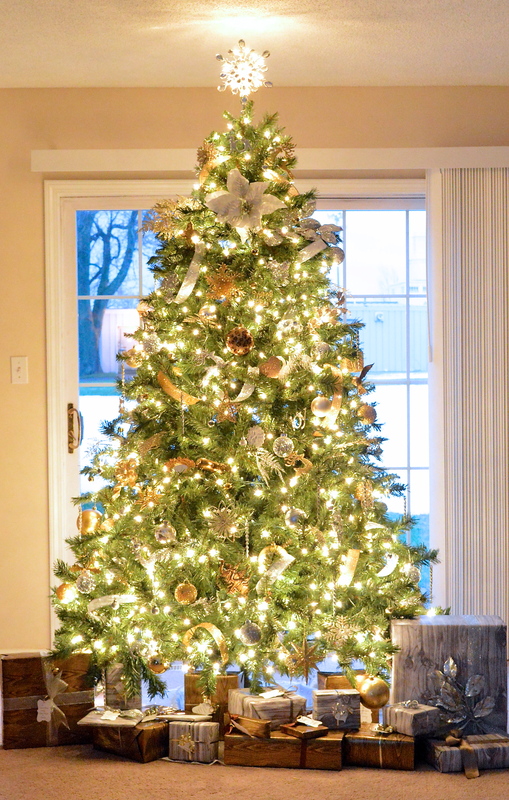 Whether you’re looking for some last minute inspiration for your own tree or just want something to get yourself in the holiday spirit, I’ll share some glimpses of my tree! You can also get some more inspiration with my Winter Lodge themed mantle that I posted on last week! 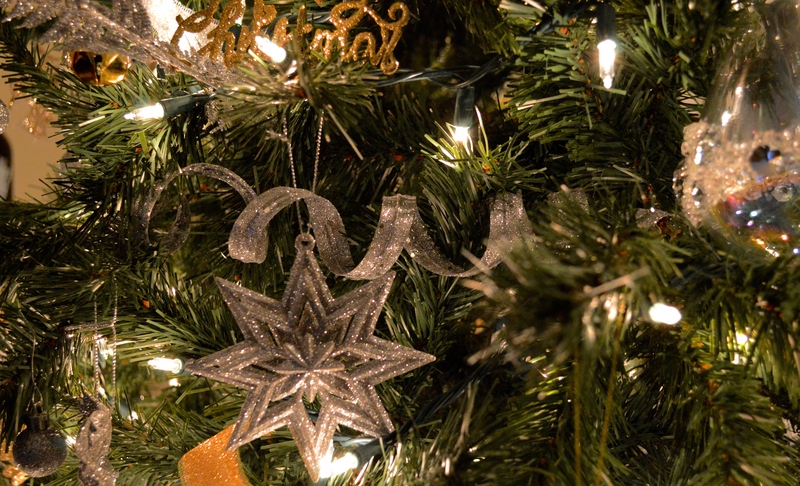 I have always loved the sparkly + glittery ornaments the most on Christmas trees so when the time came to decorate my own I knew I wanted to go with a gold + silver theme. The actual tree is this one and it is wrapped with 4 strings of clear lights. I put it on a timer so that it’s on every night when I get home from work and turns off when I go to bed each night. 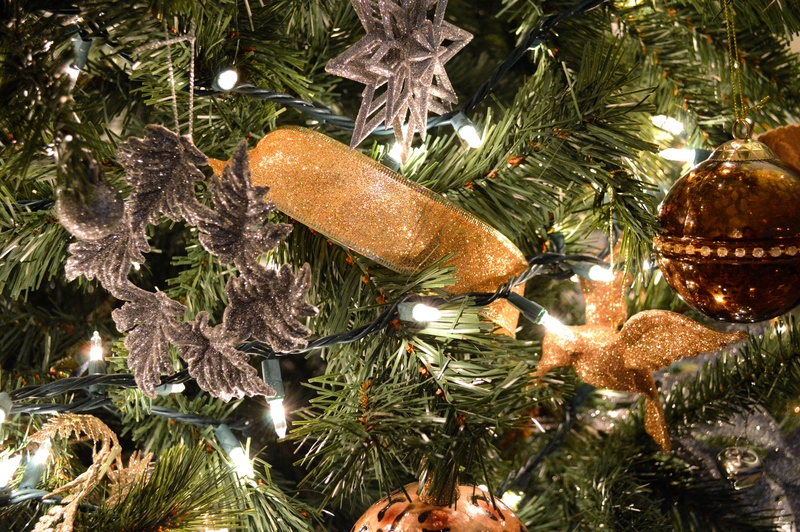 The next thing I like to do to start filling in the tree without using ornaments just yet is insert glitter picks. I get them at Joanne Fabrics in different styles in silver and gold glitter + they’re usually between 20 cents and $1 each. 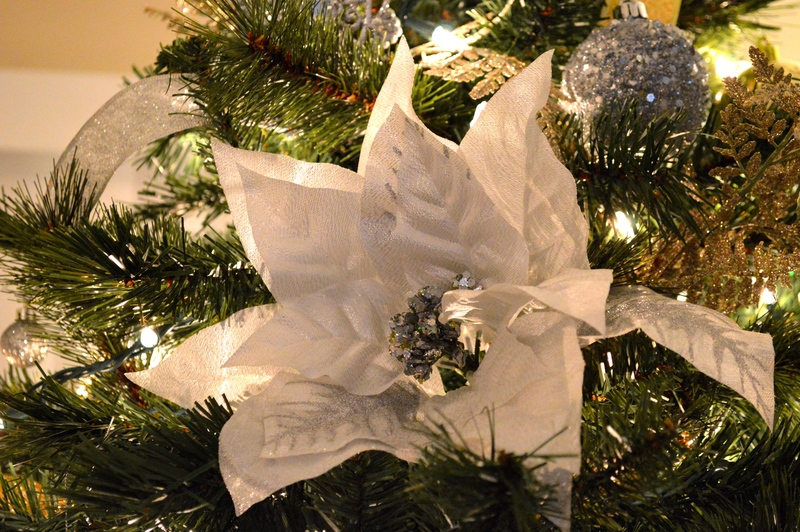 This adds some dimension and sparkle to the tree + it’s a unique touch. 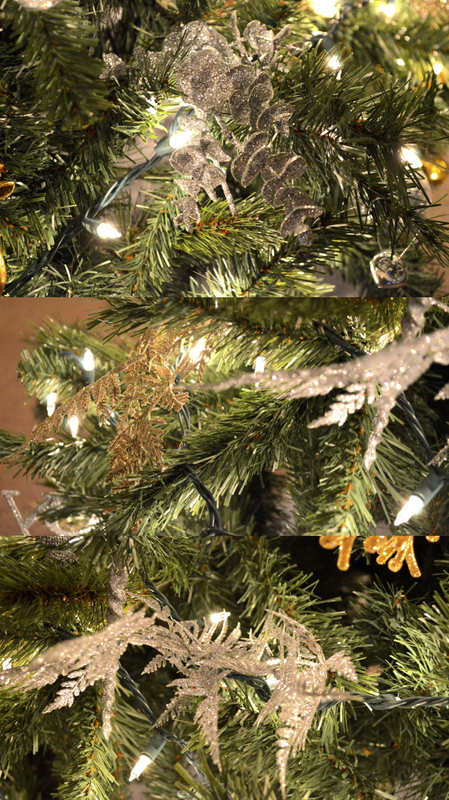 Once I have some picks in place, I take wired glitter ribbon and put curved pieces randomly all over the tree. This again adds some sparkle + also fills in some space without being hard to do and it doesn’t involve wrapping the tree. 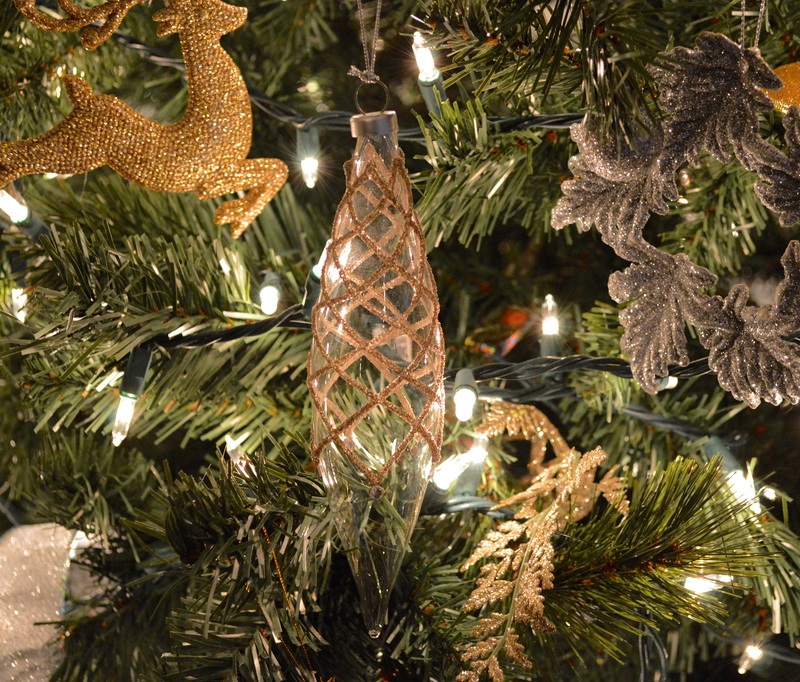 I also used some of the wired silver spirals from last year’s mantle in the tree this year. Once I have all of the picks + ribbons in, I load the tree with “fillers”. The include silver + gold jingle bells, silver glitter “icicles” from the dollar store + tiny glitter ball ornaments that I got at Target for $1 tube. This helps to fill in some of the branches without costing a lot of money or being too extravagant. I find that adding these filler ornaments + the ribbons + picks allows you to use less “real” ornaments and it helps them to really showcase because these little ornaments aren’t pulling focus. Others are ones that I’ve collected over the years. I like glass ones, ones with embellishments + ones with beads or sparkles that I know will make the tree shine that much more. 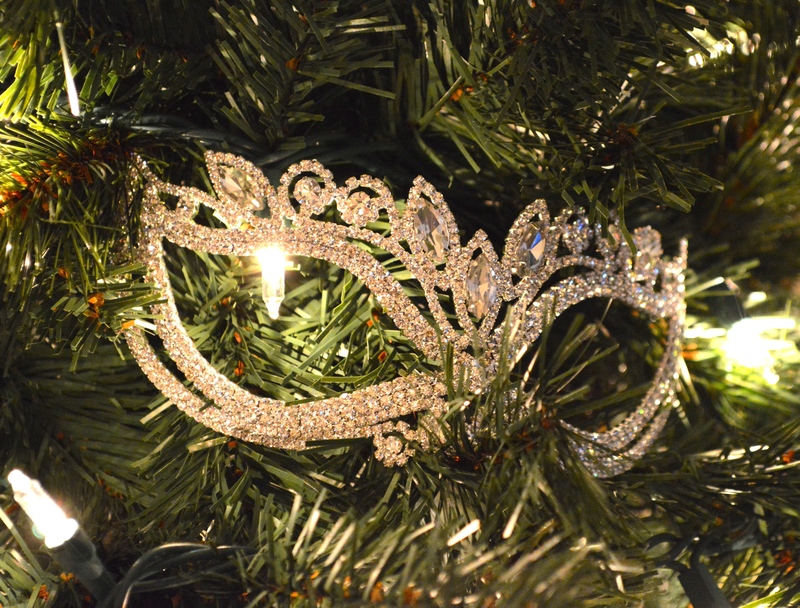 I also like to put unconventional items in the tree, like this crystal masquerade mask or a huge faux poinsettia because I think it’s a fun twist! I have some fancy ornaments in the tree but I also like to mix it up with some like these that are just from the dollar store. 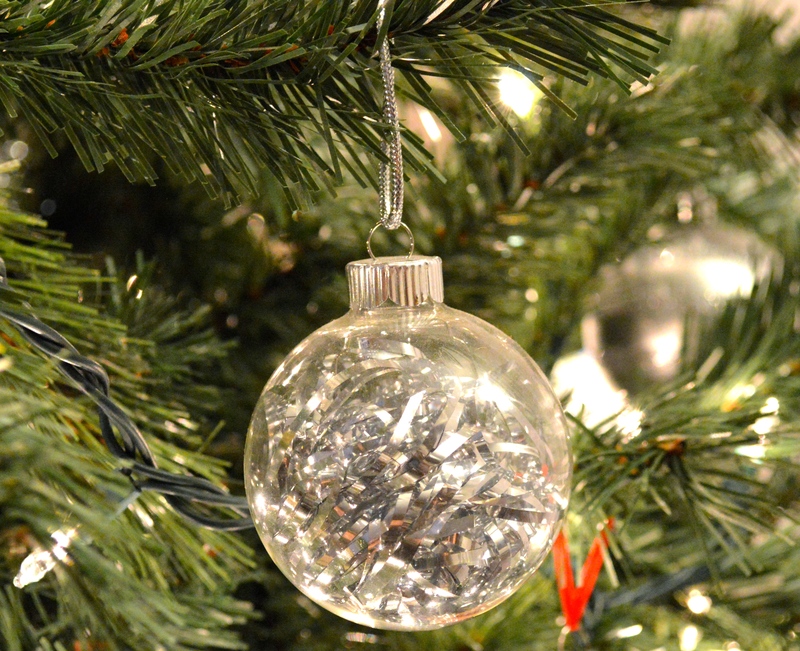 I also take some clear glass ball ornaments and fill them with metallic shredding for a fun DIY ornament that costs next to nothing. 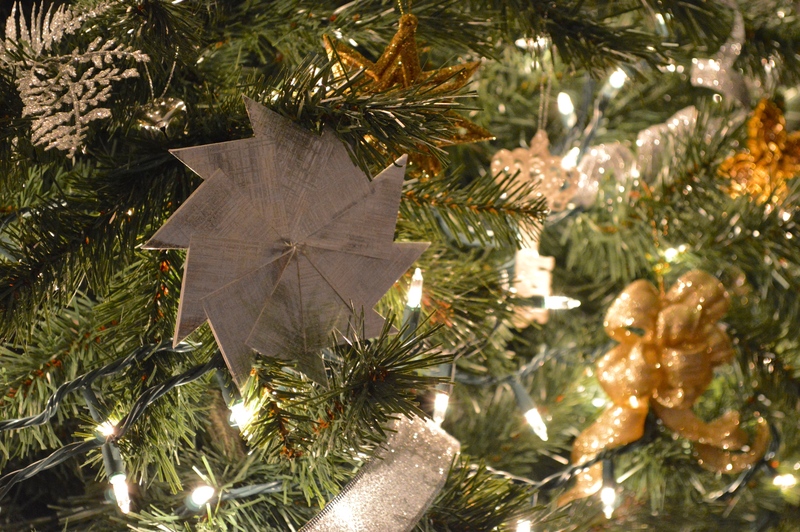 I also like to sneak in some of the DIY ornaments I’ve made like the clay imprint ones and the paper starbursts ones that I just nestle in the branches. 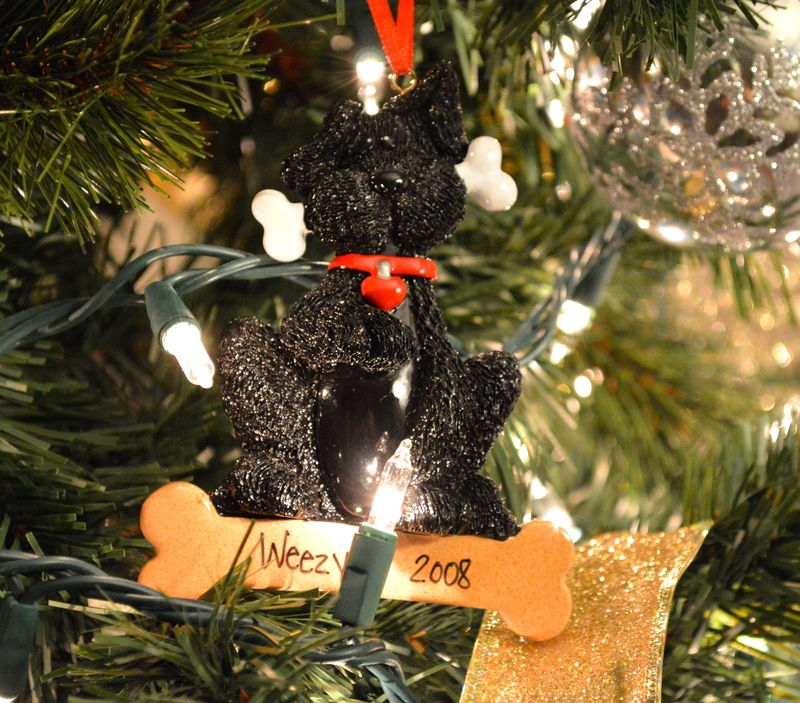 The back of the tree contains all the personalized ones we get every year, mostly because they are all colorful and don’t match the tree but I still love to get them each year! All in all I am in love with the tree, it’s right in the middle of the living room + the first thing I see when I walk in the house. Two things I’d love to change is the tree skirt and the topper. I have been wanting to make a white + natural version of my burlap ruffle tree skirt but just never have the time and I have been searching for years for a topper I like better! Someday it will all come together but for now I love it the way it is! Love the tree! 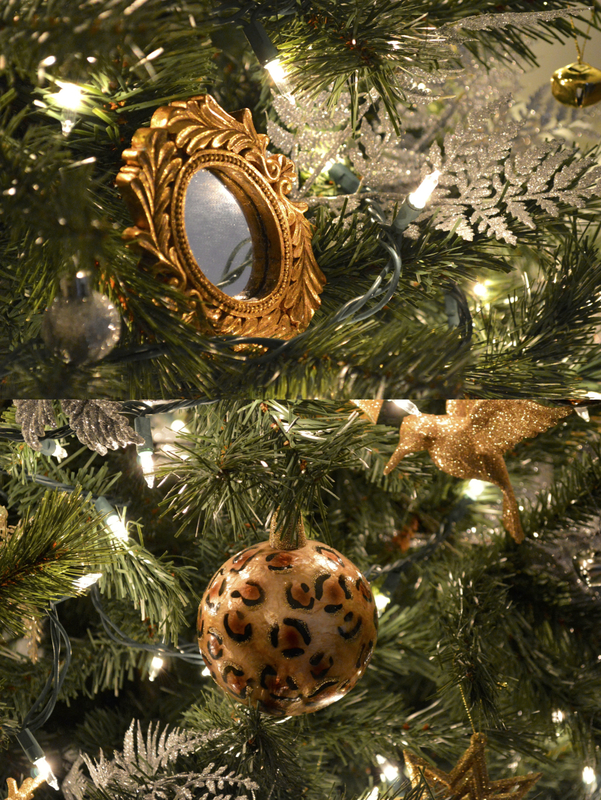 Especially the leopard ornament it is my favorite!!! Thank you! That’s one of my favorites too! Your tree is beautiful, it looks so classy and for some reason very peaceful! Merry Christmas! Thank you so much!! Merry Christmas to you as well! That christmas tree looks stunning. Elegant, classy and not too much! Perfect combination of colors 🙂 Very nice!